Stock # PEB93283, Regular Unleaded V-8 6.2 L/379, Automatic, 29071 mi. GREAT MILES 29,075! NAV, Heated Leather Seats, Sunroof, Tow Hitch, Back-Up Camera, Premium Sound System, 4x4, Bed Liner, TOUGH BED SPRAY-IN BEDLINER, ENGINE: 6.2L 2-VALVE SOHC EFI NA V8 F... POWER MOONROOF. CLICK ME! Navigation, 4x4, Back-Up Camera, Premium Sound System, Satellite Radio, iPod/MP3 Input, Bluetooth, Trailer Hitch, Remote Engine Start, Dual Zone A/C, WiFi Hotspot MP3 Player, Keyless Entry, Privacy Glass, Steering Wheel Controls, Electronic Stability Control. WHEELS: 20 PREMIUM CAST ALUMINUM W/KING RANCH light caribou painted pockets and bright hub cover and light caribou center ornament w/King Ranch logo, POWER MOONROOF map lights and moonroof switches, TOUGH BED SPRAY-IN BEDLINER tailgate-guard, black box bed tie-down hooks and black bed attachment bolts, ELECTRONIC LOCKING W/4.30 AXLE RATIO, ENGINE: 6.2L 2-VALVE SOHC EFI NA V8 FLEX-FUEL (STD), TIRES: LT275/65RX18E BSW A/S (STD), BLACK, UNIQUE KING RANCH LEATHER 40/CONSOLE/40 FRONT SEATS Mesa Antique Affect leather seating surfaces w/matching 60/40 rear bench w/partitioned locking under seat storage, 12V powerpoint, dual integrated cupholders in armrest, 2 outboard head restraints, 10-way power, memory, easy-entry/exit driver`s seat and heated/cooled driver and passenger seating, Console. 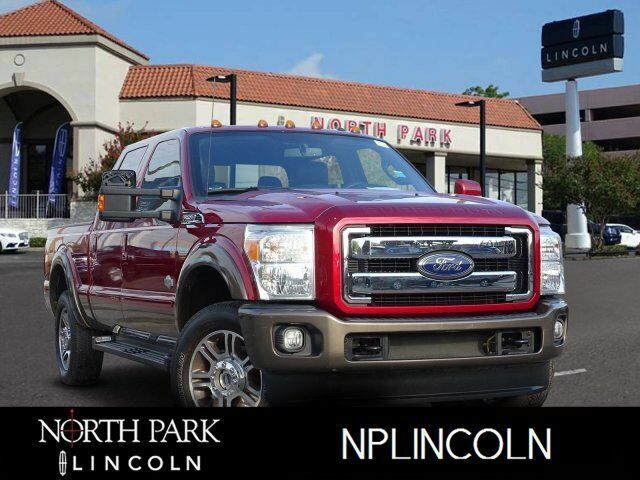 2016 Ford Super Duty F-250 Pickup with Ruby Red Metallic Tinted Clearcoat exterior and Black interior features a 8 Cylinder Engine with 385 HP at 5500 RPM*. CARFAX 1-Owner Edmunds.com explains On the road, the 2016 Ford F-250 is noticeably quieter than you might expect..